Got my eeePC last week when it was launch in Singapore and have decided to upgrade this beauty. What I intend to upgrade is the harddisk and the RAM. I got the parts a few days after I played with the eeePC and I would say that this mini system is cute and funky. The finishing is glossy (Read: Attract fingerprint) but the overall feel is solid and functional. I like the multi touch pad which is easy to use and the feature do come in handy. 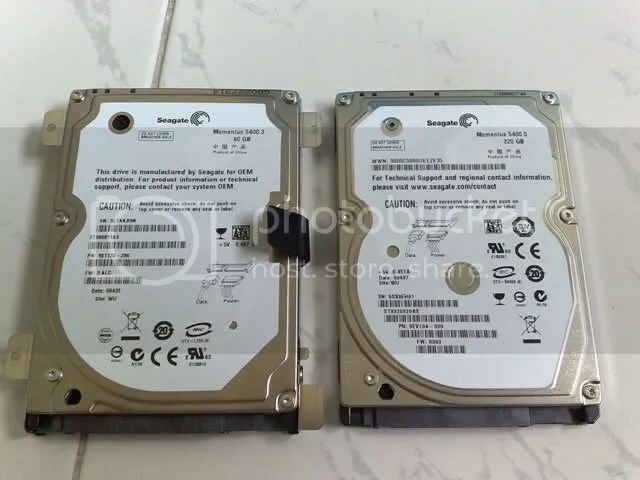 The new harddisk is interesting as it is newly launch from Seagate 5400.5 which is 2 generation ahead of the default 5400.3 80G harddisk from Seagate. The 5th generation disk is not much faster than the 4th but according to the online spec it max power is 1.3W which is almost 1W lower. That alone should prolong the battery life of most laptop by 15 minutes. I will post the benchmark of the drive at a later date. but it seem that the current Seagate is faster and more power efficient that it competitor. The estimated power consumption of the eeePC is 12W a saving of 1W is a big deal. The Seagate 7200.3 drive is not available in Singapore at current time writing. Buying from oversea would take a while. and it cost almost 3 times more than the 5400 drive. So I settled for the 5400 one. 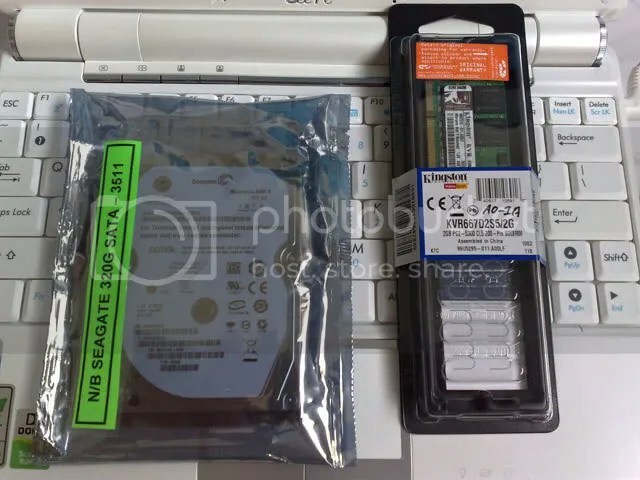 It is really easy to open up the eeePC to upgrade this 2 item and it took me less than 10 mins to complete the swap of parts. Asus even have a tab to pull out the harddisk which is the first time I see it available on a laptop. Maybe they think changing harddisk is as common as changing battery. But a real nice touch. Wonderful boot screen showing the parts working, now the time wasting part of installing the OS. Worst I do not have a USB CD-ROM. Installing from USB memory is a pain most have to format the C: drive which is very time consuming/wasting. 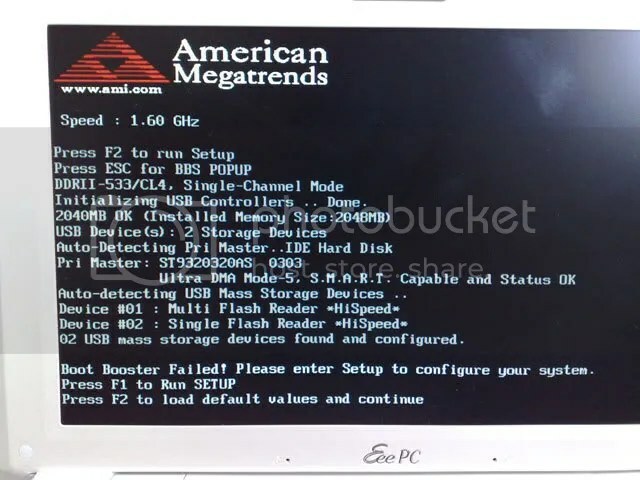 One thing I noted is Boot Booster in ASUS bios, if you are upgrading part or need to tweak with the system it is best to turn it off while upgrading and turn it back on after the whole process is over. Save yourself some pulling of hair. Does it comes with the XP CD and the drivers?How did you reinstall the XP and drivers? If you do not have an external CD Rom how can we do it? The 1000H comes with a CD with XP and all the drivers. But you need to have a USB CD-ROM. Thanks for the posting. I’ve 1000h with 2G upgrade. My next upgrade shld be 320GB hdd. Nice work. 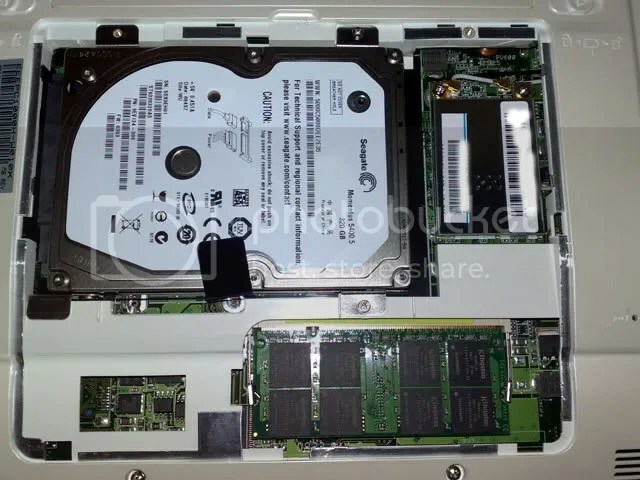 How about the noise from the hdd?